Tuesday-Teaser-palooza — With a Prize! Starting tomorrow and running through October and November, our Tuesday Teaser will be a banded bird from this fall’s bird-banding project at Harrier Meadow. Do not try to answer this first teaser until it is posted on Tuesday. It is a two-part question! This entry was posted in Uncategorized on September 30, 2013 by Jim Wright. 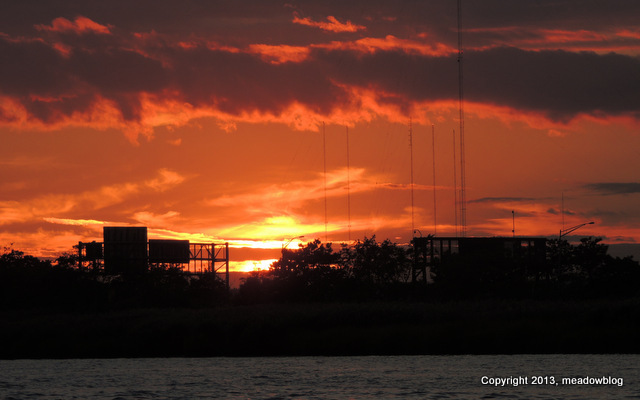 Each Monday, we will post the upcoming events for the Meadowlands through the upcoming weekend. This week’s events are a free talk about comets and asteroids for ages 8-12 next Saturday, a free guided nature walk at Mill Creek Marsh on Sunday morning, and watercolor pencil classes for ages 6-12 on Sunday afternoon. We realize that DeKorte Park is in the middle of nowhere (and yet in the middle of everywhere) and sometimes hard to find. We also realize that folks who drive down Route 17 to get here have go through a gauntlet of traffic lights. So here’s some good news. We have new signs pointing to the key intersection of Polito Avenue and Valley Brook Avenues (the previous signs disappeared). 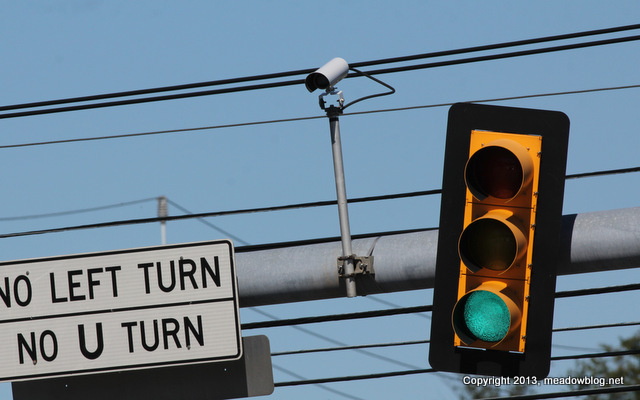 And thanks to the NJMC’s awesome MASSTR program, all of the traffic signals in the Meadowlands region — including the traffic signals on Route 17 from Williams Avenue on south — now use image-based vehicle-detection linked to advanced software that adjusts and coordinates the timing of the lights based on the volume of traffic. This saves everyone time, conserves gasoline and reduces greenhouse gas emissions. You can read more about MASSTR here. 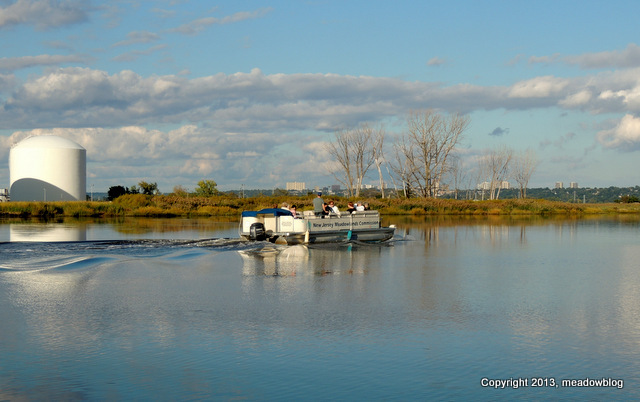 The Meadowlands Commission would like to thank everyone who participated in our 2013 pontoon-boat season. We had our last official cruise of the year yesterday evening, with three boats and 30 people. 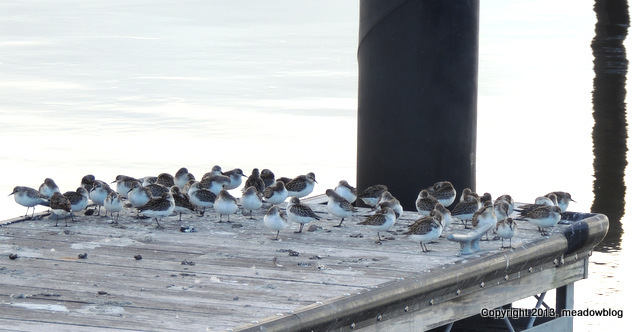 We saw plenty of nifty birds — including these four dozen migrating Semipalmated Sandpipers at River Barge Park, plenty of herons and egrets — great sights and a beautiful sunset. Full list of birds that were seen from Boat No. 1 follows. Have still been seeing butterflies at DeKorte Park and in Harrier Meadow, although in dwindling numbers, and far too few Monarchs. 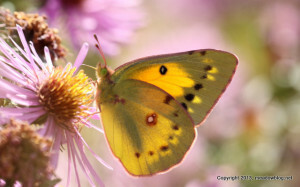 Let us know if you are still seeing many butterflies, and what species. 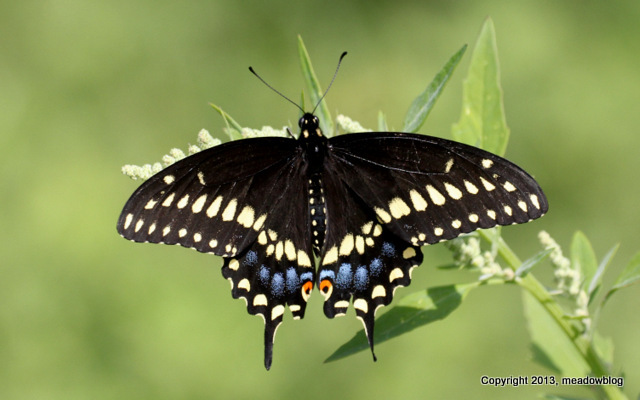 Above, a Black Swallowtail. 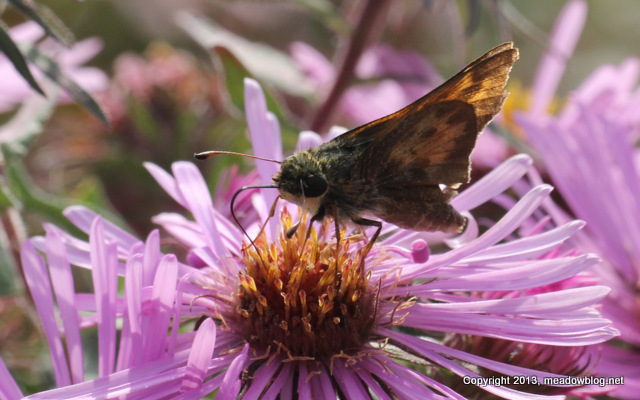 Below left, a Peck’s Skipper. Below right, a yellow sulphur. All photographed yesterday afternoon. Spent the final official afternoon of the summer on Disposal Road and adjacent areas. Mostly sunny skies and a strong south wind certainly gave a summer-like feel to the day. Raptor activity on Disposal Road was increased from what I’ve seen up till now, with several Northern Harriers, American Kestrels, and Red-tailed Hawks constantly working the Kingsland landfill. One of the kestrels did a close fly-over with insect prey, and an Osprey did a fairly low fly-over, heading south (migrant perhaps?). 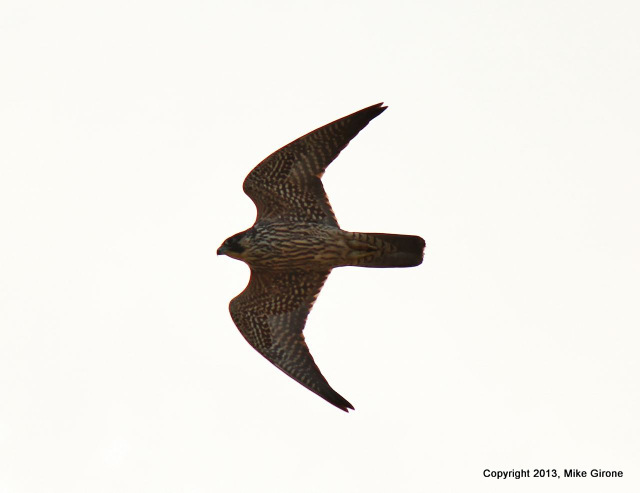 While watching the action, a juvenile Peregrine made an appearance, buzzing the landfill. It headed down toward the retention pond, flushing several dozen starlings. The falcon suddenly reappeared very close and very low! 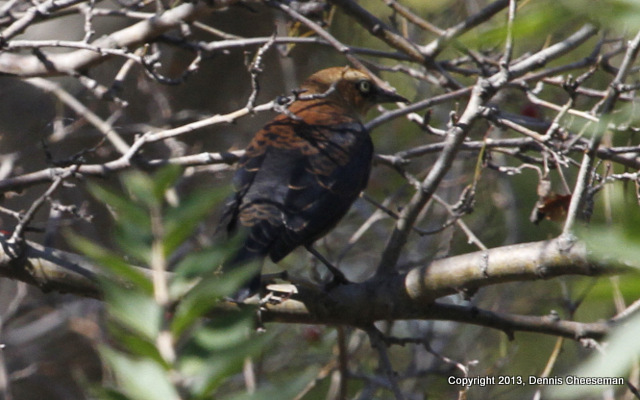 It faced into the strong south winds and practically stopped in mid-air near the entrance to Transco Trail. It then turned slightly and headed for the first set of towers on Saw Mill Creek trail. After catching up with it there, it flew off the tower and made an unsuccessful attack on a duck in a tidal impoundment. It returned to the trail, crossing it quite close and very low again, before heading for DeKorte only a few feet above the water. I never got a good enough look to check for bands. 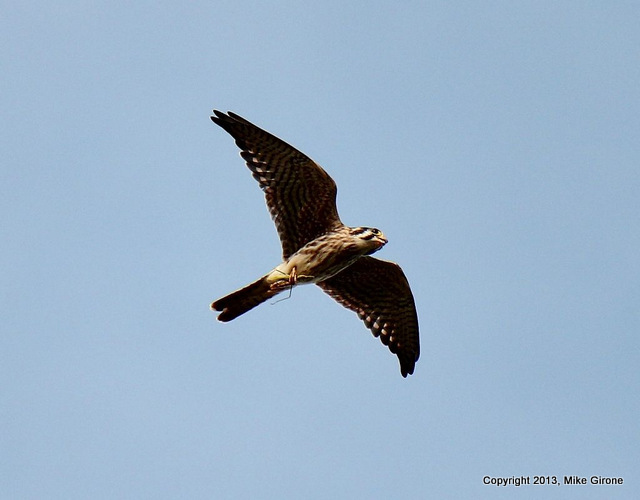 Later in the day, an unbanded adult Peregrine flew in from DeKorte with prey. It consumed it atop a tower on Saw Mill Creek trail, and after a brief rest, flew back towards DeKorte as evening settled in. 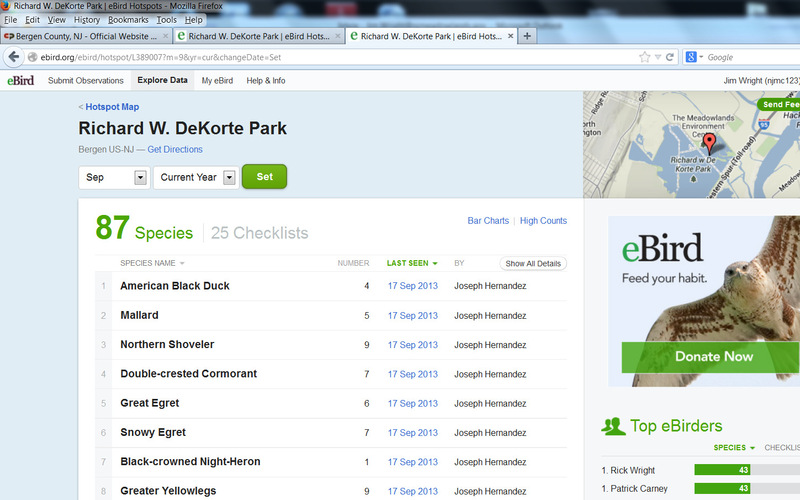 eBird has a nifty new feature called “Hotspot Explorer,” which enables you to see what has been seen recently at DeKorte Park, Laurel Hill, Mill Creek Marsh and just about everywhere else. Really easy to use, and includes a link for directions. The “Hotspot Explorer” link is here. 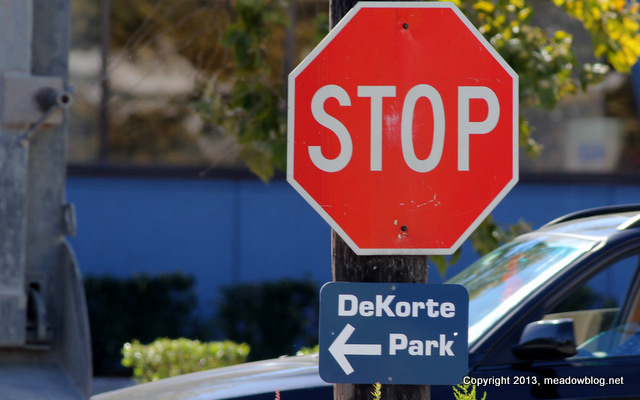 The link for DeKorte Park is here. 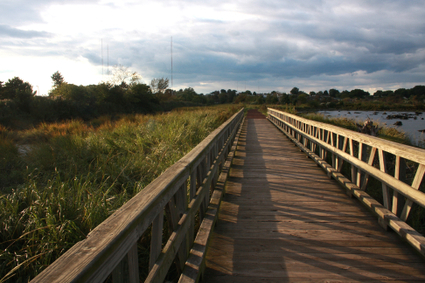 The link for Mill Creek Marsh is here. The link for Laurel Hill County Park is here. The link for Kearny Marsh is here. 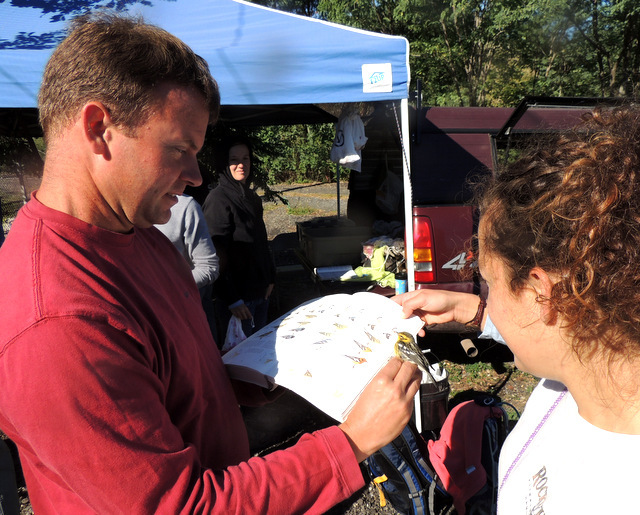 One of the coolest parts of my job is watching the Meadowlands Commission’s annual fall bird-banding research project. For the past six autumns, NJMC Naturalist Mike Newhouse and his small group of volunteers have been briefly capturing birds in delicate netting, and then weighing them and determining their age and gender. The birds are beautiful, even if the setting is old-style Meadowlands — in the parking lot of the closed Erie landfill, next to a PSE&G substation in North Arlington. And since they enter their banding information into a national data base, researchers everywhere can benefit. 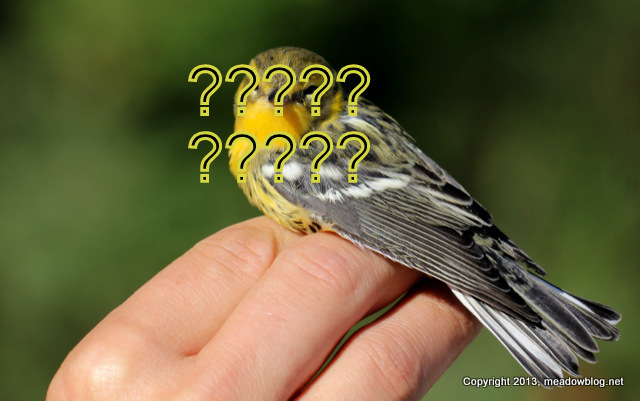 In some cases, Mike’s crew may recapture a bird they banded just a few days before. When that happens, they check to see if the bird’s weight has changed. If it has, that means that the landfill is providing a wonderful rest stop for birds as they fly south. Thought we’d take advantage of the beautiful weather on the first full day of autumn on Sunday. We put in at River Barge Park in Carlstadt (free boat ramp) and paddled up the Hackensack River a short ways to Mill Creek Marsh. Shot above is a fellow paddler entering the Hackensack River at Mill Creek Point — with the sports complex and MetLife Stadium in the background and a couple of Double-crested Cormorants on the pilings. 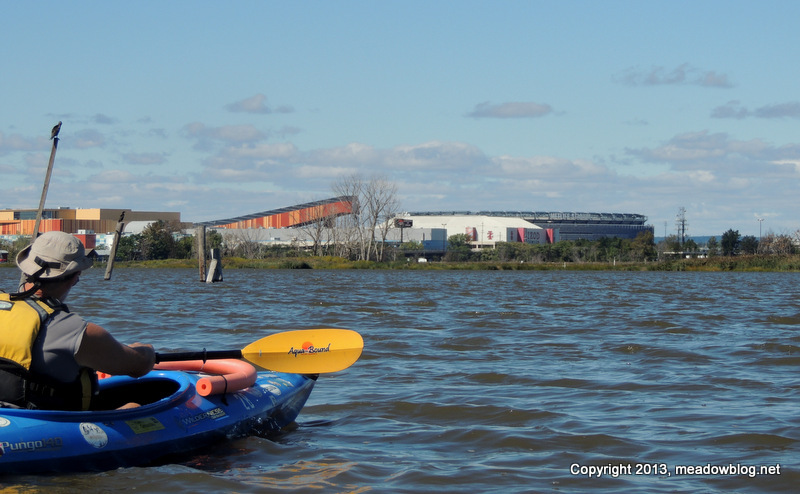 Just a reminder that autumn is still a great time to kayak in the Meadowlands.